You don't have to glance at the calendar to know it's Autumn. It's c-c-c-old out there, stores are already overpopulated with Christmas paraphernalia, and the NHL season breaks the ice this week (Go Leafs Go!). And Dairy Queen has re-introduced a Blizzard classic for the month of October only. Welcome! Welcome! 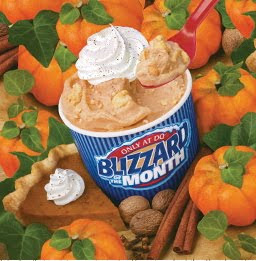 The return of the very popular Pumpkin Pie Blizzard. It's all about the pumpkins...and nutmeg and whipped topping. Very timely as Canadian Thanksgiving is a mere week away! Just where has this year gone? Now, I cannot fib... this Blizzard is not actually one that I am salivating over. First of all, there's the pumpkin aspect... and yeah, it's kind of a big hurdle for me! I'm perpetually in a tizzy over the chocolate themed Blizzards but am not about to step in the way of the Bliz faithful who covet the seasonal soft-serve treats. I'm all for the Pumpkin Blizzard in theory -- and I'm sure if you like that sort of thing, it's awesome! interesting...this reminds me of the Pumpkin Spice Latte at Starbucks... I ordered it and it actually tasted ok, then I took of the lid and saw the orange coffee and strangely it tasted different after that....of course I like ice cream so this may work better for me than coffee. Yesssssss!!!!! My favourite Blizzard has returned! As for the Pumpkin Spice latte at Starbucks... no word of a lie, my favourite day of the year is the day that they start offering the Pumpkin Spice latte again. Look past the fact that it's an orange latte, it smells and tastes sooooo good! Starrynic, I suggest you try the Pumpkin Pie Blizzard. Pumpkin lattes might not be everyone's bag, but the Blizzard is insanely good. StarryNic and Emily, as a non-coffee drinker (yes, we do exist! LOL!) even *I* get excited when Starbucks and other vendors start selling their seasonal bevies. I just like knowing that they're out there, making people a bit more enthusiastic about the holidays. Doesn't Starbucks do a gingerbread type drink too? With your recommendation Em, I might *just might* try the pumpkin blizzard too. I can't promise anything but I'm a bit closer to partaking than I was before I read your comment.